I have discovered that there is a reprinted version of the 1985 Birds issue that is very different from the original versions. Before showing these I wish to assure all who read this that the reprinting was done under legal grounds. After some read this they may start calling them fakes or forgeries. In essence they are simply unauthorized reprints made by a stamp dealer named Clive Feigenbaum. Unlike the Saint Vincent Elvis and Michael Jackson unauthorized reprints at this time there is no evidence that these reprints are "secondary". I use the term "secondary" because some issues (like the Michael Jackson and Elvis Presley issues) were reprinted by the Format Printers. This set was reprinted after Format closed the doors and at present there is no evidence that the Format Printers ever reprinted the set. Therefore, very few original proofs, progressive color proof sets, etc; exist. The majority come from this unauthorized reprinting. For this Nevis set there is quite an extreme difference from most of the other unauthorized reprint sets. There is a blue screening thoughout the stamp which is much more pronounced than on other unauthorized reprint sets. A possible reason they are scarce. If mixed in with originals they would be quite noticeable. I must state at this point, that on the quantities of this reprinting the standard would probably be the same as on the Leaders of the World Automobiles and Locomotives series. Basing on the Format Printers practices at the time for reprints. It is probable that the same standard of quantity production has been followed with the reprinting after the Format Printers closed their doors forever for this issue. (iii) Protecting the integrity and interests of the Saint Kitts/Nevis Philatelic Bureau. It is unknown at this time when these unauthorized reprint stamps first appeared. Because they have the exact same characteristics as the unauthorized reprints of the St. Vincent Michael Jackson and Elvis Presley stamp sets, there is a 100% probability they came onto the market in the same timeframe. Clive Feigenbaum had access to the original artwork transparencies and printing plates separations and for this set the original plates so the unauthorized reprints are of fair quality. The stamps are more than capable of not being detected by all dealers, stamp collectors, and now, Bird topical collectors. There are however, a number of distinguishing features on the reprints (that are illustrated below), which make them easy to identify from the original stamps. At present I can only find the 2nd issue set as unauthorized reprints. There are a lot of imperforates and color proofs for both issued sets so a comparison is needed with the originals to define them. Unlike most of the other unauthorized reprint sets, this set has very few of the normal perforated reprints available on the market. The reason for this is unknown. Perhaps many were destroyed or they are still in a holding somewhere. I would value the unauthorized reprints at nothing. This is true "wallpaper". At the time of this webpage creation approximately 5% of sales on the market contain the reprints. Others may try to disagree, but as time will tell it will be according to what the market decides....not the sellers nor "experts" as obviously there are none or this would have been known long ago. When compared side-by-side with the original stamps, the unauthorized reprint stamps look very good and use a richer set of colors allowing for more contrast in the photographs. However, don't let the colors fool you! Rule Number One (and probably the only rule needed unless comparing proofs) when identifying the unauthorized reprints is to COUNT THE PERFORATIONS! As most of these stamps are sold in se-tenant (joined) pairs, count the number of holes along the vertical join. For the original stamps, there are 24 Holes (i.e. 25 Perforations), whereas the unauthorized reprints have 27 Holes (i.e. 28 perforations). The holes in the reprints are thus noticeably smaller, and there is a tendency for all holes to not be completely punched out. In addition to the perforations being different, the unauthorized reprint stamps have a honeycomb pattern throughout the image and the details are blurred (see above); while the originals do not have a pattern and are much more detailed. These unauthorized reprints are much better quality than the Elvis and Michael reprints as the images and everything are in proper proportions. Because of this they are harder to detect without looking very closely at them. If one does not have a set of originals to compare they can easily slip by. 3.) The color between the bars where the country name and denomination is almost green gold on the unauthorized reprints where it is tan on the originals. Again in addition to the perforations being different, the unauthorized reprint stamps have a honeycomb pattern throughout the image and the details are blurred (see above); while the originals do not have a pattern and are much more detailed. Other similar features as noted above are also on this value. In addition the framing colors are shades of olive green on the unauthorized reprints versus shades of green on the originals. Again, the unauthorized reprint stamps are instantly recognizable by the number of perforations (27 Holes instead of 24) and demonstrate the same features of printing as the closeup shows. 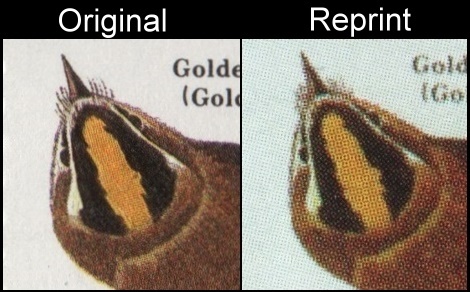 Noting on this value that the original frame color is a deeper blue color than on the unauthorized reprint. Yet the unauthorized reprint can easily slip by because they are so close. Here again on the $2.50 values we have similar differences. This sums up the demonstration on how to identify the unauthorized reprints of the Nevis 1985 Audubon Birds stamps. As you can see, you do not have to be an expert philatelist to be able to do this. You do not even have to be a collector at all! The differences between the original stamps and the unauthorized reprints is quite obvious. 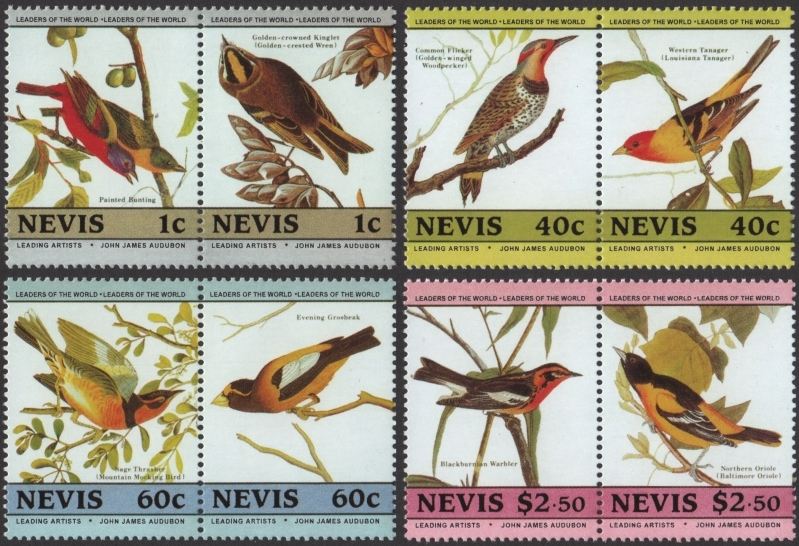 I hope that this reference page on the Nevis 1985 Audubon Birds unauthorized reprint stamps will assist all collectors, dealers and memorabilia collectors in defining and chosing which sets they have or are buying.